rodeasdown.com.au – How to get into your gran’s good books. 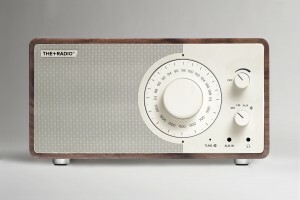 What’s the point of buying a digital radio? My mate Bob works in radio and he can’t see one despite his excitement when it was first mooted 20 years ago. I was excited too. At a planning meeting I attended in Melbourne everyone was enthusiastic. It was all about sound quality. Digital promised true high-res, better than CD quality and as good as downloads from Tidal. Which didn’t exist back then. Sure we knew broadcasters could lower the quality of the digital transmission in order to split the bandwidth available to them into more stations, but only the talk and sport stations would do that, right? We figured the music stations, like the serious FM broadcasters, would devote their entire bandwidth to one or two stations playing music at a quality that would make our spines shimmer. Ah, how idealistic we were. Digital radio has now been operating in Australia for nearly a decade and there are stations galore from every broadcaster. ABC Classic, that vast repository of spine-shimmering music, has conceded bandwidth to ABC local, national, sport, jazz, news etc, and the commercial stations have maximised their potential advertising by maximising the number of stations they broadcast. We even get temporary stations for visiting artists. The sad fact of all this is that FM radio frequently sounds better than digital. Hence Bob’s disappointment. You don’t go digital for sound quality, you do it for all those additional stations. And you’ll be living in a capital city because digital only works in capital cities. In the vast spaces between you’ll need FM and maybe AM. But there’s another reason you’d buy a digital; as a pressie for your gran. She doesn’t have to twirl a tuning dial with unsteady hands hoping she can land on her station. The display lists all the stations available, she just scrolls to her station and presses enter. The clever Plus Audio DAB+/FM radio takes this convenience to the next level. Once tuned in to your local offerings (it takes about 30 seconds) it not only lists all the digital radio stations, but the FMs as well. So by scrolling through the list you can find the FM stations as well as the digitals, and select them by pressing enter. This makes it way simpler to operate than many other DAB+/FM radios. Your gran will love it and you’ll appreciate it too, it’s neat. The remote, however, may prove daunting. What you will love most is the radio’s sound quality. 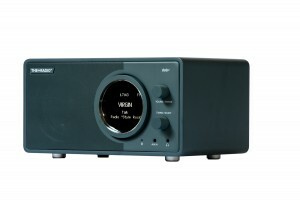 This is a compact unit at 22 x 11 x 16 cm (WxHxD) but it has a big, full sound that’s deep and lustrous. It can get a bit muddy when there’s a lot of bass happening, otherwise it’s clearly defined and sharp. And if you buy the identically-sized add-on speaker, which comes with a generous length of connection cable, you’ll get stereo. Make sure the balance control at the rear is centred. The Plus gets an alarm for bedside. It also gets Bluetooth, with which it does an acceptable job, an aux input and a headphone plug. 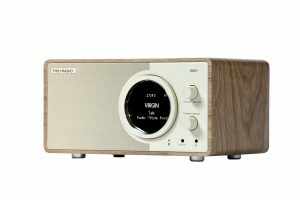 There is a range of finishes and it costs $449; the add-on speaker is $100. For caravans and boats it can operate on 12 volts. If, like Bob, you can’t see the point of digital, Plus also does a good-sounding AM/FM radio with a conventional tuner at $349. This also gets Bluetooth, an aux input and a headphone jack, and goes stereo with the add-on speaker. It works on 12 volts too, but there’s no remote.